Improve the shape of your nose in just 15 minutes with the Non-Surgical Rhinoplasty, also known as a Non-Surgical Nose Job. Non-surgical nose reshaping is the application of the hyaluronic acid temporary dermal fillers into various areas of the nose and it can just correct small imperfections. For instance, if you have got a bump in the middle, a little bit of filler either side of the bump can then just create a smoother profile and it can actually prevent the need for you to go down the surgical route because a surgical rhinoplasty is quite an extensive procedure. If you have the non-surgical treatment it will show you if you would want to have a more permanent solution so it’s a good thing either prior to surgery or to smooth out small imperfections in the nose. When we’re doing the non-surgical nose reshaping you’ll come into clinic, we do a full consultation, we put some anaesthetic cream onto the area that needs to be treated and this will just take the edge off of the discomfort. It’s not really painful but there’s a small discomfort to be felt but it’s very quick. You’re probably in clinic for a total of about 45 minutes to 1 hour because we do like to take some photographs before and after but the actual injecting time is probably only about 10 to 15 minutes. Unhappy with the shape of your nose but can’t afford the cost or face the pain of surgery? Then the Non-Surgical Nose Job may be for you. Using a combination of Botox and Dermal Fillers, the contours of your nose can be reshaped in as little as 15 minutes. This treatment is an effective alternative to more traditional surgical nose jobs and many people are now choosing this approach due to its affordability and little downtime. 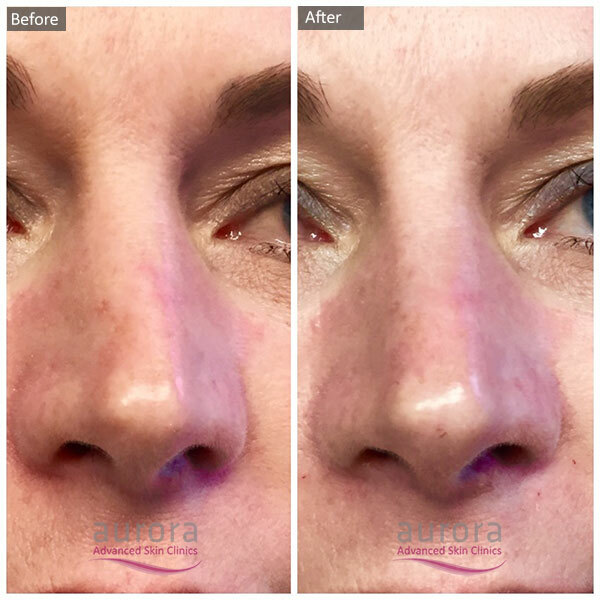 “I felt over the moon after my treatment with Aurora because I had always been unhappy with my uneven nose. I feel much less conscious of my side profile now – particularly in photographs. I loved the result so much that I actually felt quite emotional!” – Sarah J. If you are considering a surgical nose job but want to have a better idea of your expected results, then having the non-surgical alternative could aid you in your decision-making process. If you have already undergone a surgical Rhinoplasty but feel you still have small imperfections, then this treatment may also be beneficial to rectify these issues. The actual procedure takes as little as 15 minutes to complete and although not a permanent solution, results can last for up to 2 years. Following treatment, there is very little downtime but you may experience some slight swelling for a couple of days. The Non-Surgical Nose Job is an advanced Dermal Filler technique and as such should only be carried out by highly experienced medical practitioners in aesthetic injections. Clinical Lead and Aesthetic Nurse Mel Recchia offers this treatment at The Paddocks in Buckinghamshire and The Gatehouse in Northampton. We are also more than happy to book you in for a follow up appointment with Mel, free of charge should you have any concerns post-treatment. The total price is £500. In comparison to the price of a surgical Rhinoplasty procedure of between £4000 – £5000, this is a significant saving. Why choose to have your Non-Surgical Nose Job with Aurora Skin Clinics? At Aurora Skin Clinics we do not believe in a ‘one size fits all’ approach. Our patients come to us for a range of different reasons and have different expectations and desired results from treatment. To gain an understanding of your skin concerns we ask you to visit us for a free of charge consultation. This will give you the opportunity to discuss your insecurities and desired results with our Aesthetic Nurse Practitioner, Mel Recchia. From this, she can determine which treatment would be most suitable for your needs. To book your free consultation with Mel, please give the team a call on 01844 318825 or use our quick contact form to make an enquiry.